President Shimon Peres addressed the European Parliament in Strasburg on Tuesday and called for a resumption of negotiations with the Palestinians as part of a two-state solution. "There is no other solution," he said before discussing the Iranian threat and calling on the European Union to recognize Hezbollah as a terrorist organization. "I stand here before you, burning memories in my heart, great hopes in my soul," Peres said before telling the audience about his Polish hometown whose inhabitants were burned alive eight years after his family immigrated to Israel. "People age. Dreams are ageless. We changed. Europe changed. I came to express our admiration for the changed Europe. Europe picked itself up in the wake of the worst of world wars," he continued. "I know that you are facing an economic crisis, but your skies are without clouds of war." Peres compared the miracle of the establishment of the European Union after World War II to the miracle of the establishment of the State of Israel after the Holocaust. "Our relations here and now are a dialogue between two miracles," he remarked. "Israel is an island in a stormy ocean. We have to defend our island. And we are interested in the tranquilization of the sea," Peres said. He then discussed the peace process between Israel and the Palestinians and said that he believes that peace can be achieved soon. "The peace process with the Palestinians already has an agreed beginning and an agreed solution. Two states for two nations. An Arab state – Palestine. A Jewish state – Israel – living in peace, security and economic cooperation. Peace for Israel is not just a strategic choice. It is a moral call which stems from the depth of our heritage." Peres further added, "Now it is time to continue. To renew the peace process. We must continue to work with the Palestinian Authority. Support its economy. Achieve peace. "In a short while, a new Israeli government will be formed. It is an occasion to resume peace negotiations. To realize the two-state solution. There is no other solution." The president remarked that he knows Palestinian President Mahmoud Abbas for many years calling him a "real partner for peace." Peres later discussed the Iranian threat claiming that its current regime is the biggest threat to world peace. According to Peres, the Islamic Republic endangers the independence of Arab countries, threatens the existence of Israel and smuggles weapons to other countries to undermine their stability. "They (the Iranians) deny the Holocaust. They call for another Holocaust," he warned. 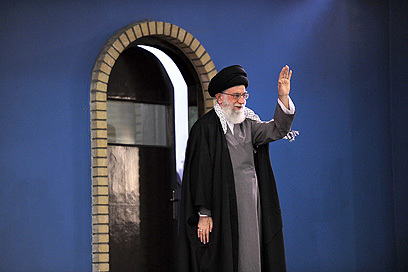 "A nuclear bomb in the hands of an irresponsible regime is an imminent danger to the world. To stop this danger, you rightly decided to impose economic sanctions. You made it clear that if the Iranians will not respond, other options are on the table." 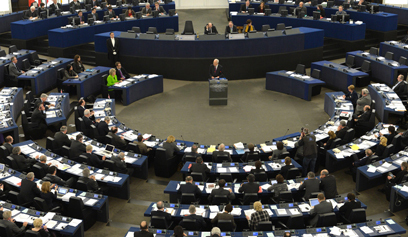 He called on the EU to raise a "clear voice" against the violation of human rights by the Iranian regime. "A moral voice will encourage the Iranian people in their fight for freedom, in their struggle against misery." 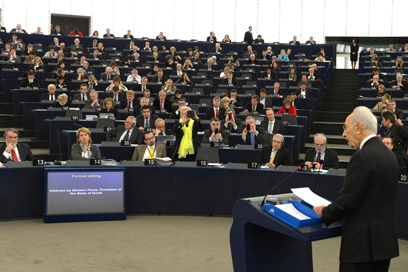 The president then addressed the threat posed by Hezbollah and called on the EU to recognize it as a terrorist group. "We appeal to you – call terror – terror. Save Lebanon from terrorist madness. Save the Syrian people from Iran’s proxies. Save your citizens and ours from Hezbollah. The international community must designate Hezbollah as a terrorist organization." Peres also outlined a plan to stop the Syrian civil war and said that the Arab League must be given a mandate to intervene. "The intervention of Western forces would be perceived as a foreign interference. "The Arab League can and should form a provisional government in Syria to stop the massacre, to prevent Syria from falling to pieces. The United Nations should support an Arab force in blue helmets." The president ended his speech by discussing the importance of science and brain research and praised the Israeli-EU cooperation in this field. He received a standing ovation. See all talkbacks "Peres: Now is the time to realize 2-state solution "